BRISTOL, Tenn. — Ryan Blaney locked horns with Ryan Newman at Bristol Motor Speedway and survived to tell the tale. A full-contact Sunday afternoon back-and-forth between them in the late going of the Food City 500 ended with both Ryans sharing a post-race laugh about it on pit road. The good-natured ribbing and squeeze of the shoulders was easier to stomach after both salvaged top-10 finishes on a day of survival at the rugged Tennessee half-mile. With 72 laps to go, Blaney’s Team Penske No. 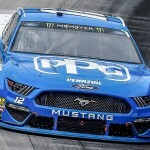 12 Ford carried momentum up into Newman’s Roush Fenway Racing No. 6 Ford at the exit of Turn 2. The two Mustangs collided, and Newman’s car scraped against the outside retaining wall. A handful of laps later, Newman gave Blaney’s car a substantial nudge in retaliation, but both continued without further incident. Blaney explained that Josh Williams, his spotter, wasn’t to blame. “Yeah, I put him in the fence off of (turn) two on accident. 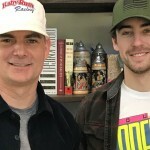 I tried to clear him myself,” Blaney said. “Just racing hard on a restart and my spotter said he was still out there, but I stayed on the gas trying to clear him myself. I fenced him and I felt bad about that. He got me back. He fenced me off the frontstretch, so that’s hard racing. Blaney and Newman persevered, though both had realistic chances of placing higher on the scoring pylon. Blaney finished fourth, despite leading a race-high 158 of the 500 laps. And Newman grabbed his best finish of the season in ninth, overcoming a penalty for improper fueling on a Lap 435 pit stop. Blaney’s effort was his fourth top-five result in the last five races. His post-race lament was his difficulty in adjusting to the variable track conditions on the rough concrete surface. Newman’s season-best marks a high point in his first year with the Roush Fenway No. 6 team, which spent time among the top five before the slight fade near the end.